The Zeppelin-Staaken Riesenflugzeuge were a series of very large bomber aircraft, usually powered by four or more engines, designed and built in Germany from 1915 to 1919. The first Zeppelin-Staaken R-planes were designed by Ferdinand von Zeppelin, aided by Robert Bosch GmbH (engineers), the V.G.O. I, (Versuchsbau Gotha-Ost), was built at Gothaer Waggonfabrik due to lack of facilities at the Zeppelin works, hence the V.G.O. Designator. This large aircraft set the seal on what was to come, with a 42.2m (138 ft 5in) wingspan it was very large by the standards of 1915. Other design traits were: podded engines suspended between the mainplanes either side of the fuselage, with accommodation for engineers and/or gunners; an engine installed in the nose; tricycle undercarriage with the aircraft able to stand nose down or tail down onto a tail-skid; a box like tail unit with biplane tailplanes and twin fins with rudders, (some later variants also had a central fin). The engine installations differed with each aircraft type but generally followed the layout of a single nose engine, usually driving a two-bladed propeller and engine nacelles either side suspended by struts between the mainplanes each housing two engines in tandem, geared to drive single pusher propellers. Tractor propellers in the nose of the nacelles, driven by a pair of geared engines in tandem via extension shafts. Single engines in the nacelles, driving pusher propellers via extension shafts. Paired engines side by side in each engine nacelle, driving a single propeller via extension shafts . Tandem paired engines driving individual propellers via gearboxes and extension shafts. Construction of the aircraft was almost entirely of wood or plywood with fabric covering, steel detail fittings and struts. The wings were three bay strutted and wire-braced assemblies supporting the engine nacelles, at around mid gap and the single axle main undercarriage units. The square-section fuselage, with curved decking forward of the wings, supported the tail unit and nose twin wheel single axle nose undercarriage and housed the majority of the crew, defensive armanent positions, cockpit, cabin, and bomb load. The engine nacelles consisted of semi-monocoque wooden constructions, with the paired engines amidships, a cockpit for the engineer and defensive gun position for the gunner either forward or behind of the engines depending on whether a pusher or tractor arrangement was used. Aircraft using push-pull nacelles, i.e. individual propellers for each engine, had no provision for defensive armament, just a cockpit for the engineer amidships. Flown principally by Rfa500 and Rfa501 of the Luftstreitkrx�fte (Imperial German Air Service) on operations, the Zeppelin-Staaken R-planes flew operations over the eastern and western fronts as well as strategic bombing of targets in England and France. Zeppelin-Staaken V.G.O.I The first of the Zeppelin-Staaken R-planes was constructed at Gothaer Waggonfabriek A.G. Initially fitted with three 240 hp (179 kW) Maybach Mb.IV engines, one in the nose and on each in the rear of the engine nacelles, the V.G.O.I was first flown on 11 April 1915. Carrying the registration 'R.M.L.1' it was built for the Kaiserliche Marine and served on the eastern front before being returned to Staaken where two additional engines were fitted in the nacelles. During flight testing, after the extra engines had been fitted, the V.G.O.I crashed killing two of its crew. One built. Zeppelin-Staaken V.G.O.II Almost identical to the V.G.O.I, the V.G.O.II serialed 'R 9/15' also served with the Luftstreitkrx�fte, (Military Aviation Service), on the eastern front and later as a trainer. One built. Zeppelin-Staaken V.G.O.III (a.k.a.R.III) To overcome the low power experienced with the V.G.O.I and V.G.O.II, Zeppelin-Staaken fitted an identical airframe with six 160hp(119KW) Mercedes DIII engines in three pairs, two side by side in the nose geared to a single tractor propeller and two side by side in each nacelle geared to single pusher propellers. 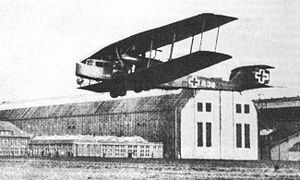 After delivery to the Luftstreitkrx�fte as 'R 10/15', the V.G.O.III was used at the eastern front by Rfa500 (Rfa - Riesenflugzeugabteilung - giant aircraft unit). One built. Zeppelin-Staaken R.IV Built at Staaken after production moved from Gothaer Waggonfabriek A.G., the R.IV although generally similar to the V.G.O.III, retained the paired 160hp(119KW) Mercedes DIII engines in the nose, but was fitted with paired 220hp(164KW) Benz BzIV engines in the engine nacelles driving single four-bladed pusher propellers. The sole R.IV serialled 'R 12/15' carried out operations on both the eastern and western fronts. One built, and the only "nose-engined" Zeppelin-Staaken R-plane to survive to the end of the war. Zeppelin-Staaken R.V Adhering to the same layout as the previous Zeppelin-Staaken R-planes, the R.V differed in having the engine nacelles arranged as tractor units with tandem mounted 240hp (179KW) Maybach MbIV powerplants and the engineers and gunners transferred to the rear of the nacelles. A single MbIV replaced the paired units of the R.IV in the nose. Additional defensive firepower was fitted in the form of the Schwalbenest (swallows nest), a nacelle on the centre-line of the upper mainplane leading edge housing a gunner with a single machine-gun. Serialled R 13/15 the R.V saw service on the western front. One built. Zeppelin-Staaken R.VI The first true production Zeppelin-Staaken R-plane was the R.VI. This giant aircraft was powered either by four 245hp (183KW) Maybach MbIV engines or four 260 hp (194 kW) Mercedes DIVa engines. The fuselage was similar to the previous aircraft but the cockpit was extended forward, enclosed and glazed with a gunner's cockpit in the extreme nose. Other improvements included aluminium alloy structure in the triple-finned biplane tailunit, which was built with inverse camber to improve the stabilising downforce. Eighteen R.VIs were built serialled 'R25' to 'R39' and 'R52' to 'R54'. All except 'R30', which was used exclusively as a supercharged engine test-bed, saw service in the Luftstreitkrx�fte with Rfa500 and Rfa 501 on the western front stationed in the Ghent area. Air raids on England by R.VIs began on 17 September 1917. Many air raids attributed to Gotha bombers were, in fact, carried out by Zeppelin-Staaken R.VI or R.XIV bombers, with direct hits on the Royal Hospital Chelsea with the first 1,000kg bomb dropped on England, on 16/17th February 1918. St Pancras railway station was attacked the next night. During the campaign from 18 December 1917 to 20 May 1918 the R.VIs of Rfa501 made eleven raids dropping 27,190kg (28tons) of bombs. Eighteen built. Zeppelin-Staaken R.VII Differing little from the R.IV, the R.VII had a revised arrangement of struts in the tail unit. The sole R.VII, serialled R 14/15, crashed during its delivery flight to the front line. One built. Zeppelin-Staaken R.XIV The R.XIV closely resembled previous Zeppelin-Staaken R-planes differing only in engine installation and details. The five Maybach MbIV engines were arranged as push-pull pairs in the nacelles, with the engineer accommodated between the engines, and a single tractor engine in the nose. Three R.XIVs were built, serialed R 43/16 to R 45/16, of which R 43/16 was shot down by Capt. Yaille of No. 151 Squadron RAF. Zeppelin-Staaken R.XV The R.XV also carried on the five engine layout of the R.XIV but introduced a large central fin in the tail unit. Three R.XVs were built, serialed R 46/16 to R 48/16, but there is no evidence that they carried out operational flights. Zeppelin-Staaken R.XVI (Av) When the new 530 hp (395 kW) Benz VI engine became available, early in 1918, Avatik (Automobil und Aviatik A.G.) at Leipzig-Heiterblick were tasked with integrating the new more powerful engine into the R.VI airframe due to the commitments of the Zeppelin-Staaken factory and Aviatiks experience in building the R.VI under licence. The new engines were installed in the nose positions of the nacelles driving tractor propellers, with 220 hp (164 KW) Benz BzIV engines in the rear positions driving pusher propellers via extension shafts. Three R.XVI (Av)s were built; R 49 was completed in October 1918 but damaged its landing gear during a test flight, evidence that repairs were carried out is not available. R 50 was completed after the armistice as a civil aircraft but was scrapped under the orders of the Allied Control Commission. Construction of R 51 was well advanced at the time of the armistice, but was not completed. Zeppelin-Staaken Type “L” Seaplane This aircraft was essentially an R.VI fitted with large 13m (42ft 8in) long duralumin floats. Allocated the serial no. 1432 by the Kriegsmarine (German Navy) the aircraft was wrecked during trials. One built. Zeppelin-Staaken Type 8301 Seaplane In a further attempt to develop a useful large seaplane for the Kriegsmarine Zeppelin-Staaken used R.VI wings mated to an all new fuselage, which incorporated the large central fin of the R.XV, suspended midway between the mainplanes, all supported by floats similar to the 'Type”L”'. Three were built, serialled 8301, 8303 and 8304, of which 8301 was also tested with a land undercarriage, the existence of 8302 has not been confirmed.